The legislature’s reconsideration of Governor vetoes occurs on September 13 th . Three high profile bills that I co-sponsored are among those coming up for a veto override: SB365, requiring distribution companies to purchase electricity from NH wood burning and “waste-to-energy” power plants; SB446, raising net metering limits for solar, wind, and hydroelectric renewable energy sources from 1 to 5 megawatts; and SB593, repealing the death penalty. In order to hear from constituents on these and other issues, I’m hosting constituent hours on Thursday, September 6, from 5:00 pm - 7:00 pm on the second floor of the Old County Courthouse in Citizens Hall. You can park at the County Building. Please attend and share your opinions on these issues. Kahn Interns at Walpole Town Green after a day of canvassing. Town Democrats have organized meetings in Gilsum, Alstead, Hinsdale, and Marlborough. House parties are planned in Keene and Nelson. Town visits are on-going: this past week in Roxbury, North Walpole, and Harrisville; Labor Day week in Keene, Winchester, Hinsdale, and Harrisville; the following week in Sullivan; and then the primary election and veto session. Hinsdale Dems are hosting state legislators seeking reelection on Sept. 9 at 2 pm in the Millstream Community Center. Please attend if you can. This summer I’ve benefitted from nine Kahn-terns, interns from surrounding high schools that are working for my reelection. They are terrific symbols of a next generation of concerned students willing to work to change the world. They are my ground team. Primary elections are September 11 th . I’m recruiting supporters to hold signs at polls. Let me know if you can spare an hour or two. Last week 30 area mental healthcare leaders convened to mobilize for future State requests for proposals (RFP) to award federal funds to reduce opioid use disorders. The proposals will build off a hub and spoke model, with medical centers being at the hub of regional 24/7 response teams. Spokes include residential and community based services. The Department of Health and Human Services will release RFPs in early October. Now that legislation is being implemented, I am trying to conclude the work on Mental Health and Social Services Interoperability Committee that I chair. I’ve been named to a new legislative study committee on telemedicine. Recently, I hosted the region’s therapeutic marijuana licensee in Keene to begin discussions on a satellite dispensary locally. Workforce preparation is one of my highest priorities. We build our workforce from the earliest years of childhood development. Symonds School in Keene is often cited as a strong example for our region, and I’ll be joining their principal, Richard Cate, and kindergarten classes later this month. This past week I talked with our Fall Mountain district superintendent, Lori Landry, about pre-school and elementary school innovations they’ve implemented. This next week I’ll be discussing internships and career-ready credentials with KSC and the new Cheshire Career Center Director, Michael Burnett. 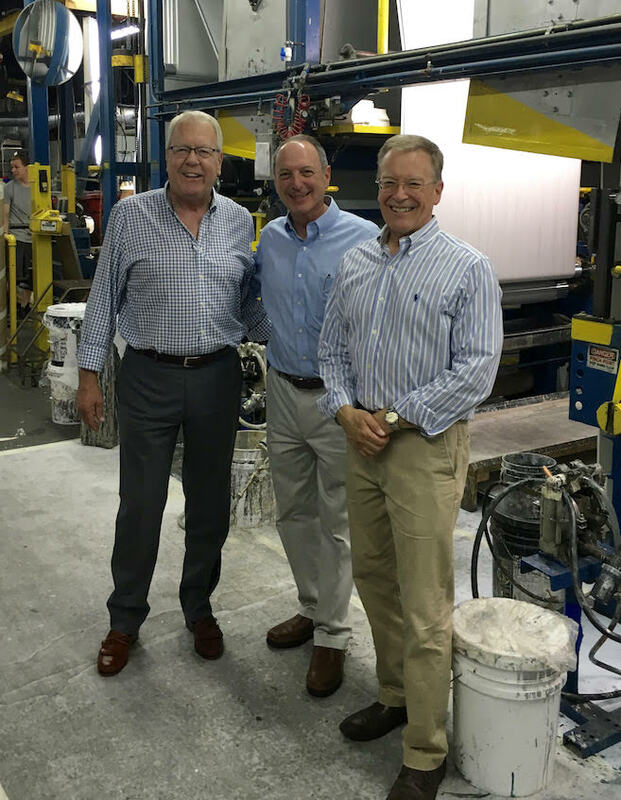 is on the floor of Len-Tex Wall-covering Manufacturing in North Walpole with Don and Charlie Lennon, owners of Len-Tex. I worked with a variety of community organizations to prepare Senate Resolutions that help honor significant accomplishments of people and organizations in the region. Recent examples are Community Kitchen rededication, MOCO new location, Winchester Learning Center expansion, MAPS relocation, and the Hinsdale Elementary School addition. In less than two years, I’ve prepared and delivered 27 resolutions. Election seasons take a long time and take a lot out of candidates. I want to reassure you how much your help and support motivates me to be a better candidate and a better Senator.